Two of the five Republican candidates for the U.S. Senate say given the problems in the Veterans Administration, it’s now time for a health care voucher system for U.S. military veterans. Candidate Sam Clovis, a retired Air Force pilot, supports giving vets a voucher or a swipe card, so they can get care anywhere, not just at a VA hospital or clinic. Candidate Matt Whitaker, a former federal prosecutor, supports vouchers for vets to buy private insurance. “A voucher system where you are offered an amount of money that you can then go nn the free market and either buy more than the voucher or buy less and the savings could then stay in your pocket and address your personal health insurance needs and health care needs,” Whitaker said. 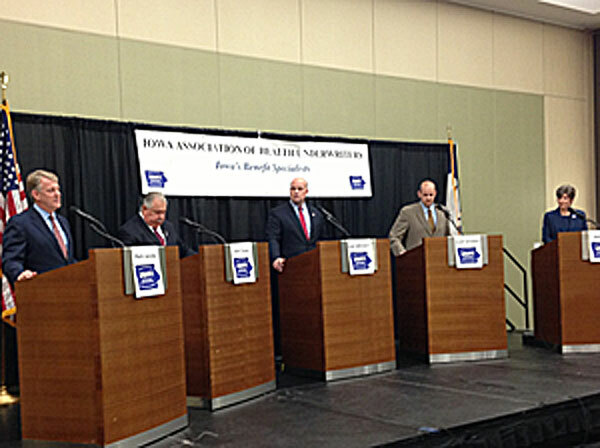 The other three candidates for the Iowa Republican Party’s U.S. Senate nomination say they’re open to the idea, but need to see the financial impact on the federal budget before they’ll endorse health care vouchers for vets. Candidate Joni Ernst, a commander in the Iowa National Guarda, says a “cost-benefit” analysis of the idea is the first step. “However, the VA as it’s standing now with the waiting lists whether it’s for mental health care, whether it’s for physicals of line of duty implications following a deployment — there’s a number of things that need to be looked at,” Ernst says. Candidate Mark Jacobs, a retired business executive, says the VA system “must be fixed” because many veterans have to drive long distances to get to a VA center. “What we need to do is we need to open up to other private-market, out-of-network options so that our veterans can get the health care, the medical care that they deserve, that we have committed to provide them and I do think we have to look at this on a cost-benefit basis,” Jacobs says. Candidate Scott Schaben, who is a Navy veteran, says it’s “an insult” that former soldiers have to wait a month or more for care, but he says a voucher system needs more analysis. 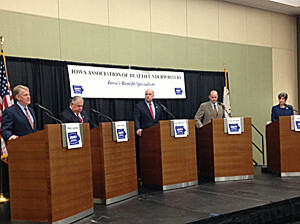 The candidates made their comments this afternoon during a forum focused on health care issues.